Hotel Madison Residence offers many services for children and families. It has WI-FI, bicycles, large swimming pool. It welcomes dogs and cats. The hotel is just a few steps from the Cattolica dock, overlooking the boats and the promontory of Gabicce. The beach can be reached in a couple of minutes, as well as the center and the pedestrian area. All rooms are equipped with a large and bright balcony with sea or internal view, air conditioning, satellite TV with Sky vision gold and digital terrestrial, air conditioning and heating, WI-FI, minibar (fridge with water only), telephone, coffee maker (only for rooms with a balcony facing the sea). Safe on request. FAMILY : interconnecting rooms are available upon request. SMALL APARTMENT : two-room apartment of 29 square meters with a large balcony of 17 square meters, divided into a living room with a sofa bed and a fully equipped kitchenette. LARGE APARTMENT : 39 square meters of two-room apartment with a balcony of 12. In addition to the living room with sofa bed, it houses a bedroom with double bed or two beds, bathroom with hairdryer. Swimming pool and hydromassage, terrace, bicycles, two lifts, bar, reading room with newspapers available, children's playground area, gym, sauna, spa, conference room with 70 seats, laundry on request. We organize theme nights with entertainment, parties and weekly aperitifs. For the day of departure there is a changing room with shower, luggage storage and late check out upon availability of the room. PARKING : uncovered, free, available until places are exhausted, garage on request. Extra parking guaranteed for everyone, reachable by shuttle. WI-FI : in the whole structure, and internet point. AIR CONDITIONING : all rooms are air-conditioned. CONVENTIONS : beach, theme parks, shuttle service to the parking lot. SERVICES FOR DISABLED: entrance with inclined ramp, elevator in accordance with. PETS : small dogs and cats allowed (up to a maximum of 5 kg). BREAKFAST : sweet and savory buffet, facing the pool. LUNCH AND DINNER : four first and four second courses, meat and fish, vegetable buffet, hors d'oeuvres and desserts. In the hotel : baby / mini club, strollers, bicycles with child seats, indoor and outdoor playground area, afternoon snack, pediatric counseling and baby sitter service on request. For those who celebrate the birthday of the child on holiday, the staff organizes a party with cake prepared by the chef. At meals : seats at the table, children's menus, vegetable broths and simple sauces, bottle warmers on request, microwave oven. Hotel Madison's pool is 150 square meters in size, with an extremely modern design, offers an area for children and the surveillance of a lifeguard at specific times. Also available a hydromassage with water heated to 32 ° and 8 seats. 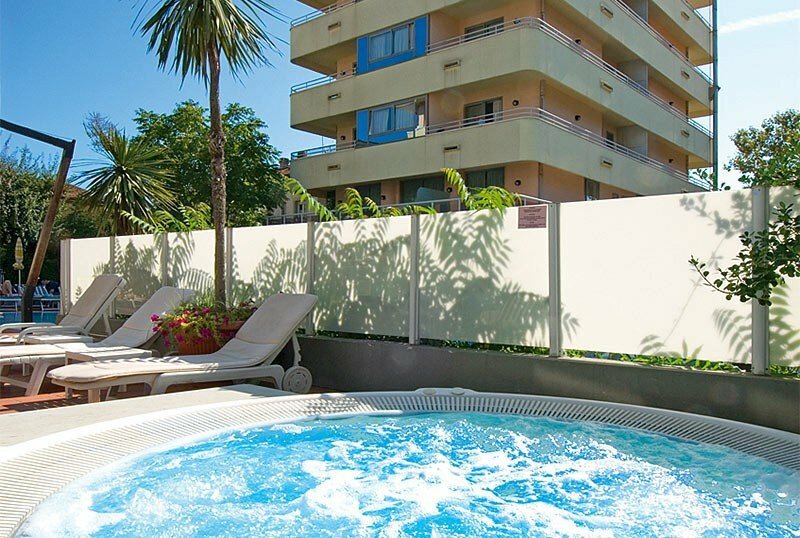 Poolside sunbeds, beach umbrella, games, WI-FI areas and a snack bar. The hotel has an agreement with the beach 21 and the bathroom number 5. Both offer many services including entertainment for adults and children, games and much more. Hotel list prices are per person per day. TOURIST TAX: € 1.50 per day per adult, for the first seven nights, children up to the age of 14 are excluded from the above prices. - The allocation of rooms and apartments will be based on the type of accommodation booked. For any further requests or specific preferences regarding room or apartment numbers, the Management will do its best to satisfy the requests but without being able to guarantee them. - Partially or completely prepaid bookings involve the issue of a fiscal document from the moment of confirmation. The standard tax document is the tax receipt. If a tax invoice is required, indicate the full company name in the notes field with VAT number and tax code. Subsequently, the issue of the tax invoice will no longer be possible. The prices of the residence price list are per week with arrivals and departures on Saturday and Sunday for a minimum stay of 7 days. TOURIST TAX: excluded, children up to 14 years exempt. - 4 people in the same apartment who choose one of these treatments will pay for 3 full rates.